Specifically tested with the Rhythm Touch 2 Way and Rhythm Touch Q, this set of reusable 20 Rhythm Touch replacement pads (adhesive gel pads) will optimize the benefit you feel when using the Rhythm Touch electrical muscle massager. 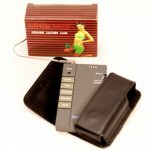 These cloth backed 20 Rhythm Touch replacement pads are constructed of a uniquely coated Silver (Ag) carbon film that provide superior conductivity and eliminate electrical current “hot spots”. 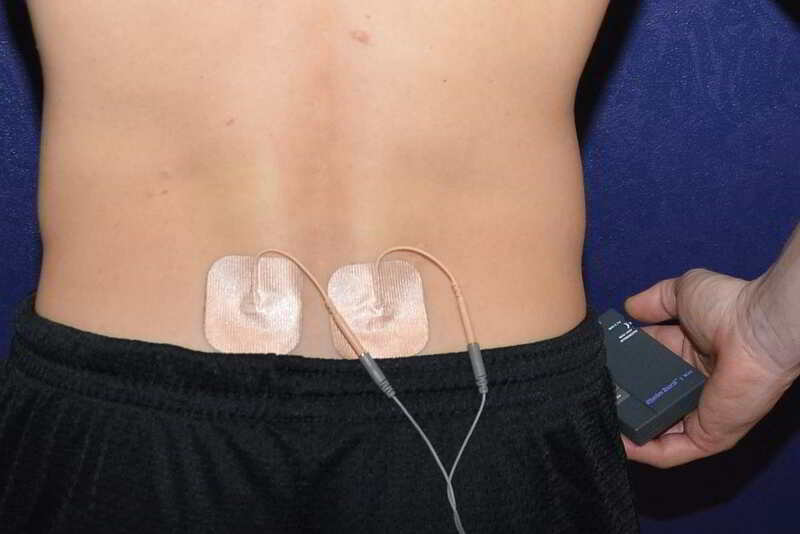 This set of twenty individual EMS / TENS electrodes for use with Rhythm Touch Q or Rhythm Touch 2-Way and other powered electrical muscle stimulators or TENS devices requiring electrodes. 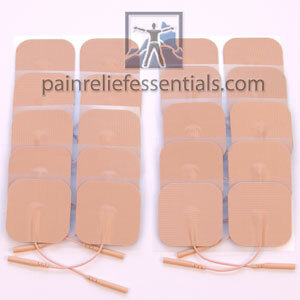 Rhythm Touch replacement pads from Pain Relief Essentials will normally last for up to 30 uses. Far more than cheaper and lower quality pads. Save 10% on Rhythm Touch Replacement Pads. Join newsletter for code. Remember to clean your skin carefully before use to help prolong the life of your pads. 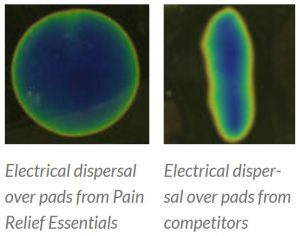 Over time the gel used for sticky electrodes will become contaminated with body oils and skin cells – which makes them less effective at delivering the frequencies from your Rhythm Touch or other EMS / TENS device correctly. 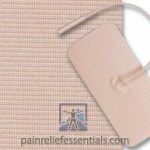 Learn more about Pain Relief Essentials high quality premium electrodes and their balance of comfort, effectiveness, durability, and price. Electrodes are normally sent the next business day from the day your order is placed. During holiday periods there may be delays. When ordered separately this product is shipped via USPS. These cloth backed Rhythm Touch replacement pads (electrodes) are constructed of a uniquely coated Silver (Ag) carbon film that provide superior conductivity and eliminate electrical current “hot spots”. 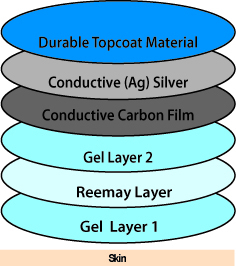 This highly conductive silver layer disperses the electrical current evenly over the entire electrode surface. Our electrodes are also manufactured with stranded copper wire instead of a carbon lead. The end result is that you will have a more comfortable and effective use of your device. This item is a set of 5 packs of electrodes amounting to 20 individual pads. 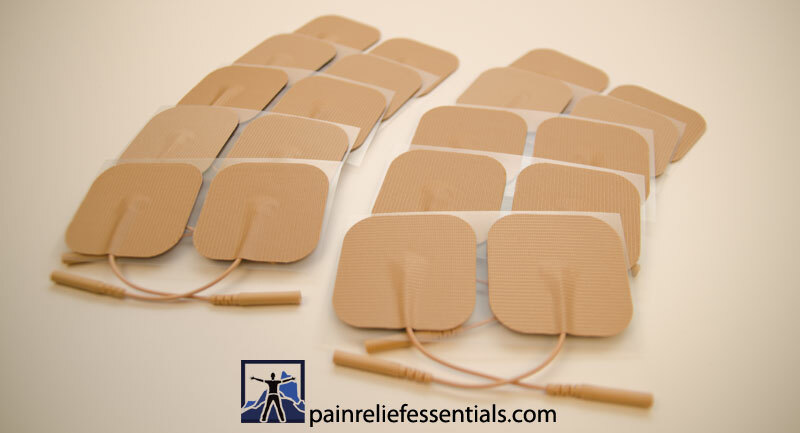 Why should you use Pain Relief Essentials electrodes? These EMS and TENS Electrodes are manufactured in the USA using state of the art processes and include special layers of material that effectively distribute the current over the majority of the electrode. This increases your comfort and the effectiveness of your device. My wife and I have been using our Rhythm Touch that we bought at the fair for about 7 years. We tried lots of other electrodes that we bought elsewhere and found that they were not nearly as comfortable as these. These are amazing. You could actually see through to the wires on the other ones and they felt like they were biting. These stick to the skin and we get a lot of uses out of them but the main thing is that they don’t hurt! And made in the USA too! These are the best ones we’ve used. I wrote a review on the 4 pack as well but have now ordered this larger pack after trying the 4 pack. These feel so much better than the other brand and I’m so glad I found them!